Matteo Genna, chief technology officer and vice president for product strategy and development at Space Systems Loral, has said SSL partnered with NASA, Air Force Research Laboratory and Deployable Space Systems to develop and test a scalable solar array platform on the International Space Station. Genna wrote in SatMagazine’s September issue the ISS demonstration conducted in June sought to validate the design and functionality of the Roll Out Solar Array as SSL works to qualify and integrate the ROSA design with its SSL 1300 satellite platform. ROSA is a modular platform composed of flexible mesh and rolled booms that work to support photovoltaic cells designed to provide high levels of power to satellite payloads and other spacecraft equipped with solar electric propulsion systems. 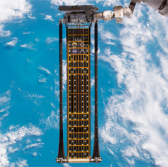 NASA and AFRL delivered ROSA to the ISS as part of a cargo resupply mission and positioned the platform through the use of a robotic arm developed by SSL’s parent company MacDonald, Dettwiler and Associates in collaboration with the Canadian Space Agency. Genna said SSL plans to integrate ROSA with its product roadmap in support of government and commercial space exploration missions and that the ISS demonstration helped qualify the platform’s mechanical components. “The measurement data obtained during the on orbit testing validated the DSS analytical models, which will allow for scaled performance predictions,” he said of the ISS demo. “SSL has already proposed the ROSA array for several different spacecraft and expects to integrate it into a flight program very soon,” Genna added.